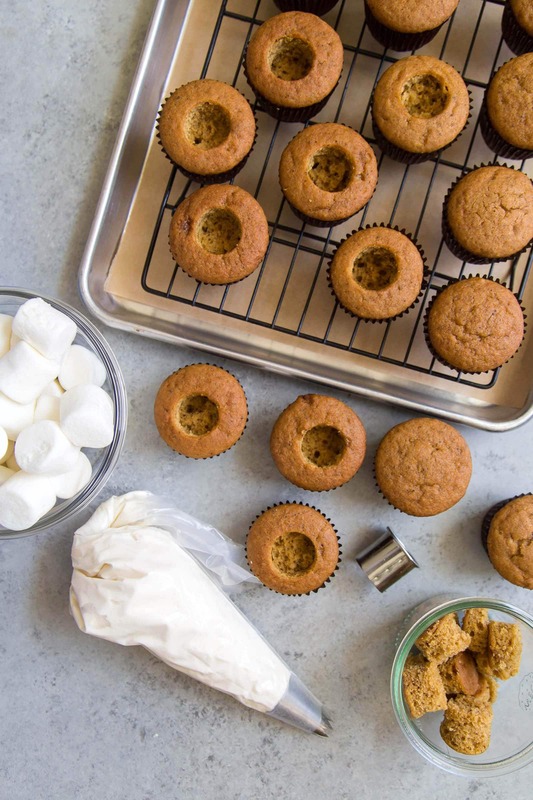 These butternut squash cupcakes are made with canned butternut squash puree and spiced with cinnamon and nutmeg. During this time of year, pumpkin reigns supreme. Pumpkin everything is everywhere. Let’s take a little break from pumpkin and focus on another member of the gourd family: butternut squash! I love butternut squash in savory applications, especially with brown butter spaghetti and baby kale or mixed into mac and cheese. I’m surprised I’ve never tried to use it in a dessert. With a can of butternut squash puree I found at Trader Joe’s, I began experimenting into the sweet world. And, it was a success. 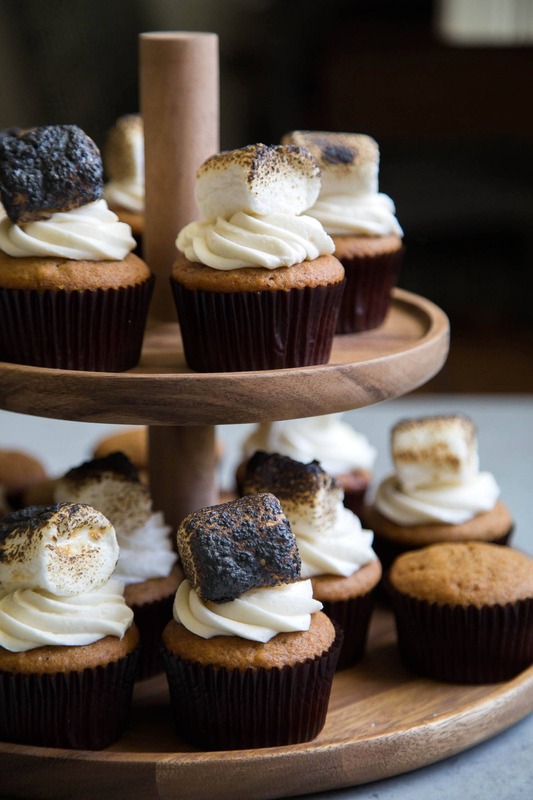 I found my new favorite cupcake: butternut squash cupcakes with maple buttercream and toasted marshmallow. Butternut squash has a very mild flavor. I find it’s quite similar to sweet potato. It pairs wonderfully with brown butter and warm spices. I used a mixture of cinnamon, nutmeg, and of course, brown butter in this recipe. 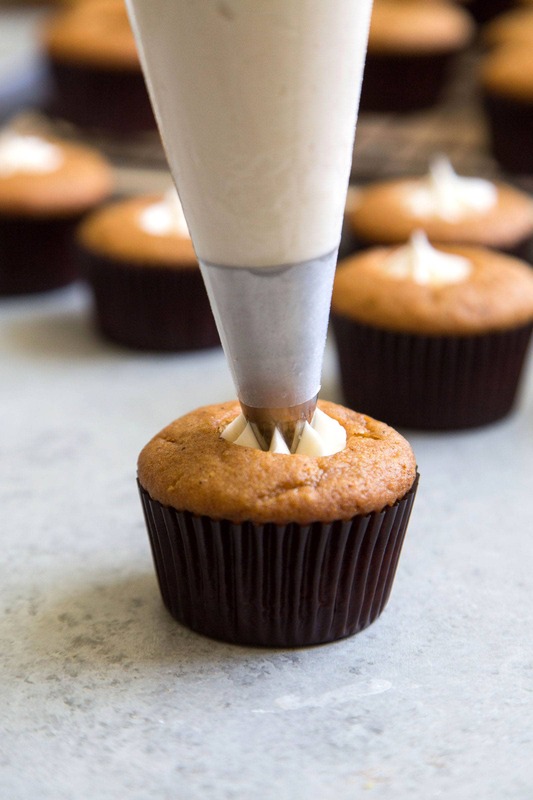 These butternut squash cupcakes are perfect on their own. I left a few unfrosted so my “taste testers” (aka Alex and who ever happens to stop by the house) could enjoy the cupcakes in its pure form. I like to punch out little cavities in the cupcakes and fill it with frosting. It adds a nice surprise and ensures the perfect cake to buttercream ratio (in my opinion). I made a quick American buttercream and sweetened it with dark maple syrup (grade B). For the finishing touch, I added a toasted marshmallow on top. 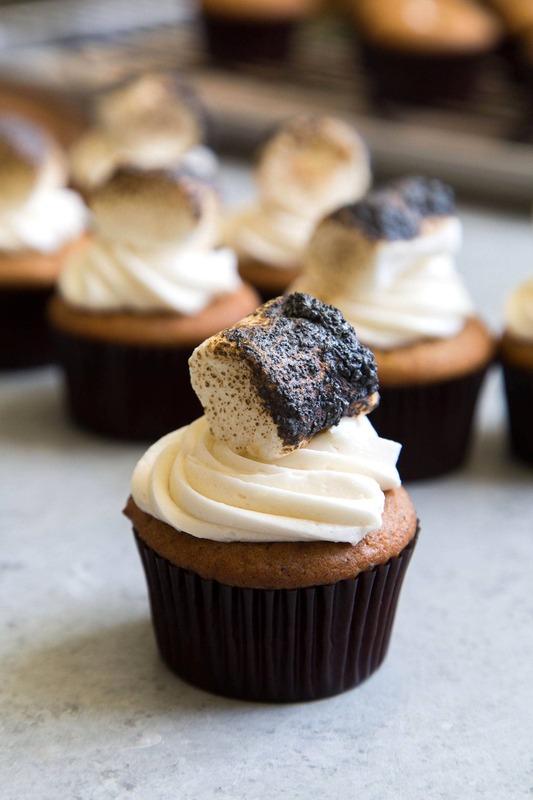 The burnt edges of the marshmallows contrasts nicely with the sweet buttercream. It makes you want another bite, and another, and another. This will definitely be making an appearance at our Thanksgiving dessert table this year! In a heavy bottomed sauce pan, melt butter over medium heat. Once the butter has melted, continue to cook. Swirl pan occasionally to ensure even heating. Mixture will bubble and foam as it cooks. The bubbling will be vigorous at the beginning but it will subside. Continue to cook until butter smells nutty. The mild solids in the butter will turn rich brown in color. Remove from heat and pour into a heat-safe bowl. Be sure to scrape out as much of the browned milk solids bits. Allow butter to chill in the fridge for 20-30 minutes until no longer warm to the touch. Butter will no solidify at this point. As long as butter is no longer hot, you may proceed to the next step. Preheat oven to 350 degrees F. Line 2 muffin tins with cupcake liners. Set aside. In the bowl of a stand mixer fitted with paddle attachment, beat together brown butter, sugar, and brown sugar until smooth. Add eggs one at a time, mixing on low speed until thoroughly combined. Scrape down bowl as needed. Add butternut square puree and mix until incorporated. In a large bowl, whisk together flour, baking soda, baking powder, cinnamon, nutmeg, and salt. Add to mixing bowl in two additions. Mix on low-medium speed until there are no longer any dry streaks of flour. Scrape down bowl as needed. Distribute batter among prepared muffin tin. Bake for 25-30 minutes until toothpick inserted in center of cake comes out clean. Allow cupcakes to cool in tin for 5 minutes. Transfer cupcakes to wire rack to cool to room temperature. In bowl of a stand mixer fitted with a paddle attachment, cream butter until smooth. Add confectioners' sugar, maple syrup, vanilla, salt, and milk. Mix on medium speed until buttercream is smooth and fluffy. Fit a piping bag with a medium star tip. Place buttercream in prepared bag. Fill the cupcake cavity with buttercream. Pipe a large rosette to cover hole. Use a kitchen torch to toast marshmallows. Alternatively, toast the marshmallows in the oven using the broiler setting. 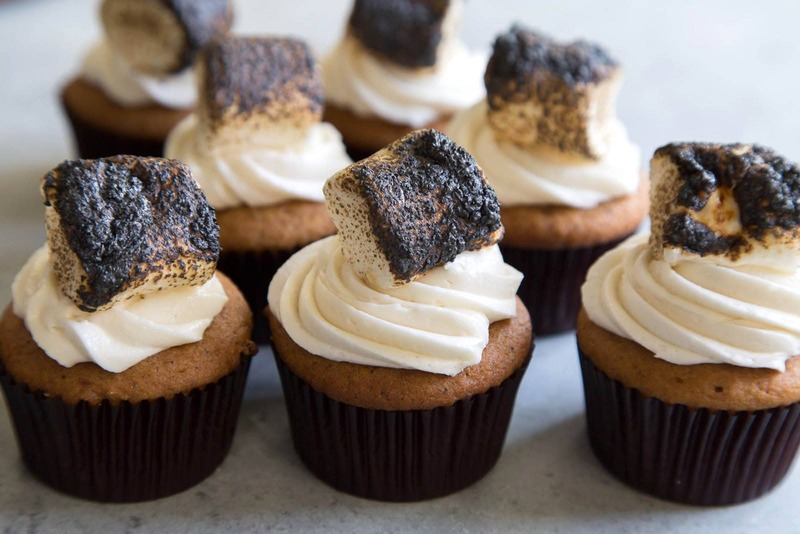 Place hot toasted marshmallow on top of frosted cupcake. Serve immediately. I used canned butternut squash puree. Alternatively, you can make your own butternut squash. Simply cook butternut squash chunks in the microwave until soft. Use a blender or food processor to puree until smooth. If you don't want to core the cupcakes, simply frost cupcakes as instructed with large rosette. I had just enough buttercream to frost all the cupcakes. If you tend to frost on the heavy side, I suggest making a double batch. love that you used butternut squash instead of pumpkin! also, as a burnt marshmallow lover (perhaps also an impatient marshmallow toaster), the topping on these sounds awesome. Burnt marshmallows are the best! Love it when its super ooey-gooey on the inside! Ok, wow. Loving the idea of using butternut squash and also good to know you can get the puree at TJ’s. I love the toasted marshmallow on top and always feel like a pure pro baker when I bust out my kitchen torch. 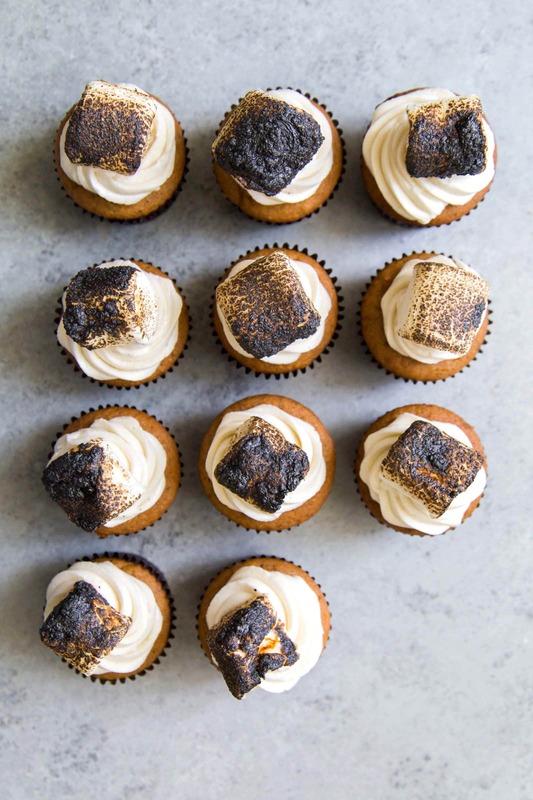 Nice tweak using butternut squash puree here, and yes, really like all of the contrasts with the buttercream vs the toasted marshmallow vs the puree vs the muffin, nice recipe, thank you (also like your tip about the cavity providing the right ration of frosting to cake)!